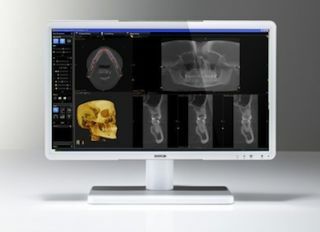 Barco has developed a brand-new 22-inch display to meet the imaging needs of dentists. The new Eonis features a fully cleanable front glass panel to prevent infection, and a unique front sensor to ensure superior, controlled image quality. Its white, sleek design and versatile mounting options make it an ideal fit for today’s dental practices, the company says. The 22-inch Eonis can be disinfected, both front and back, with commonly used cleaning agents. Stylishly white with rounded corners and an integrated cable management system, the Eonis will perfectly blend into every dental practice. The crisp, high-contrast images deliver the detail dentists need for fast, more effective interpretation of dental images, even in brightly-lit dental cabinets. To guarantee image consistency at all times, the Eonis features a unique front sensor that automatically aligns image quality every time the display is turned on. Dentists will appreciate the display’s built-in DICOM settings that allow the most accurate analysis of complex dental X-ray images. In addition, the new Eonis comes complete with Barco’s online MediCal QAWeb service, which further strengthens image consistency and allows dentists to easily personalize their image settings. When developing the dental display, Barco also paid special attention to versatility and ergonomics. The Eonis can be used with a VESA stand on the dentist’s desk, or mounted on a rotatable arm. Multiple connections are available, including extra inputs to show video content.